Festival: a time of feasting and celebration. 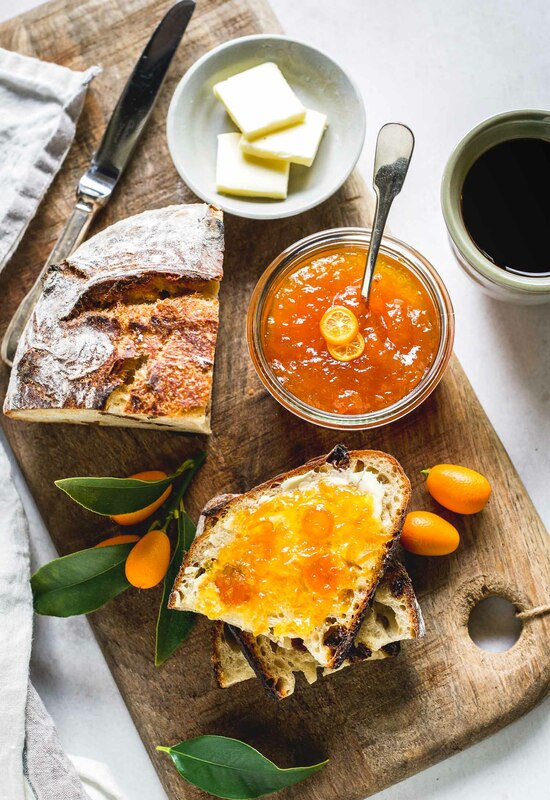 The time was this past weekend when 350 food bloggers came together in San Francisco to do what we do best: eat. We also drank and were merry, celebrating the wonderful opportunity to graduate from being “virtual” friends to finally connect face-to-face over mountains of food. 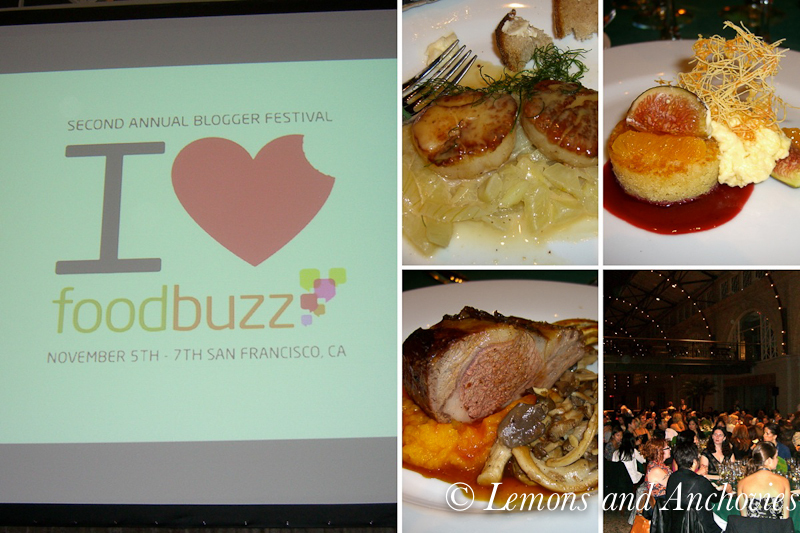 This joyous occasion was made possible by Foodbuzz (and sponsors) by hosting its Second Annual Blogger Festival. The cause for celebration? 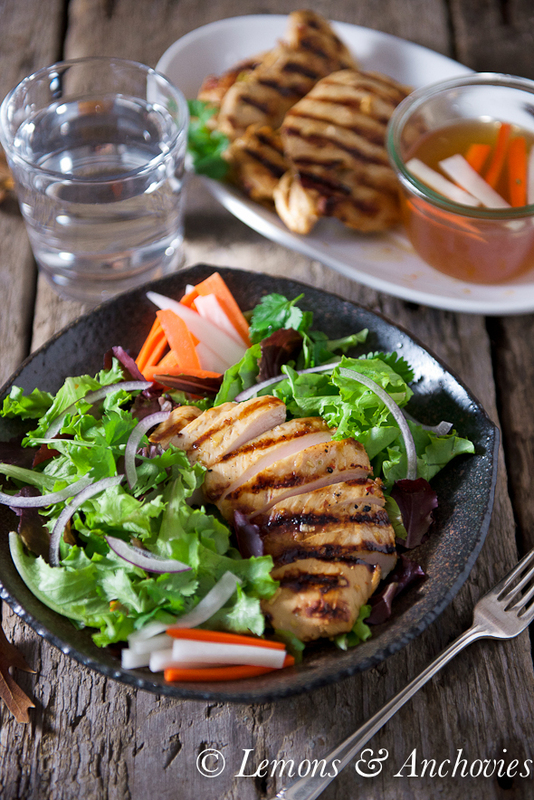 Foodbuzz has become the #1 online food property that is 4,400 bloggers, 14 million foodies and 3.4 million blog posts strong. 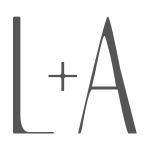 It is now the largest food blogging community in the world and I was very happy to be a part of it all. 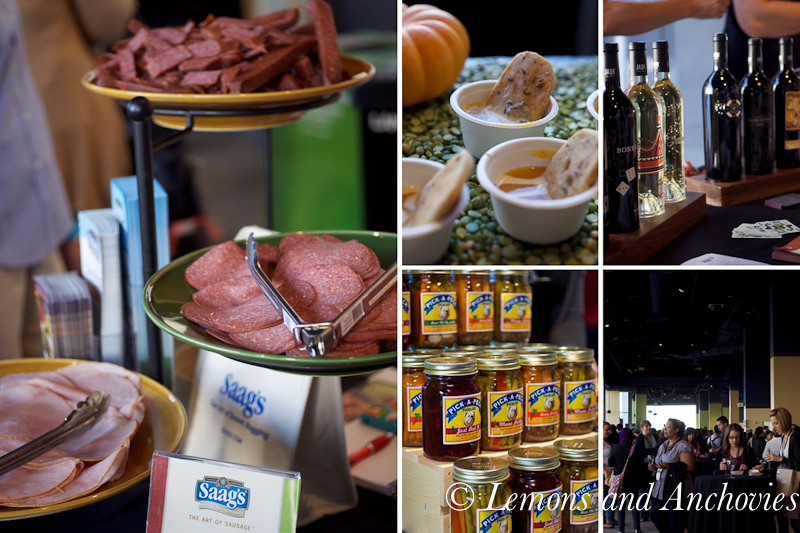 The festival kicked off with a welcome reception at Fort Mason with a foodie gift exchange. Bloggers were divided into small groups to exchange small gifts, a wonderful way to break the ice. I was the very lucky recipient of some rosemary-infused vodka from Brian at A Thought for Food. What a bonus not only to meet a nice (and fun!) guy but to also take home one of his creations. I’ve already had to fend my husband off from enjoying the vodka before giving me a chance to try a new cocktail with it so this post will be coming soon. The rest of the evening passed with everyone enjoying some of the Bay Area’s best eats, street-food style. My taste buds feasted on offerings from Roli Roti, 4505 Meats and Tacolicious before my stomach had to raise the white flag. Day Two started with a morning of learning. The Foodbuzz team organized breakout sessions for writing, video blogging and photography. As a newbie whose blogging skills are still on the uphill side of the learning curve, I appreciated so much the useful advice from these über successful bloggers: Greg at Sippity Sup, Linda at Salty Seattle, Marc at No Recipes and Brooke at Food Woolf. And what kind of food blogger festival would this be without talk of real food? 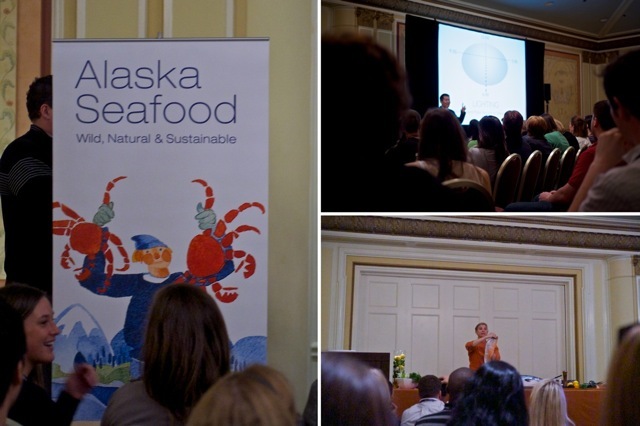 The Alaska Seafood Marketing Institute (ASMI) presented the merits of consuming sustainable fish. If you buy seafood bearing the Alaska Seafood stamp, you can be confident that that salmon, crab or halibut was caught without compromising the surrounding ecosystem. 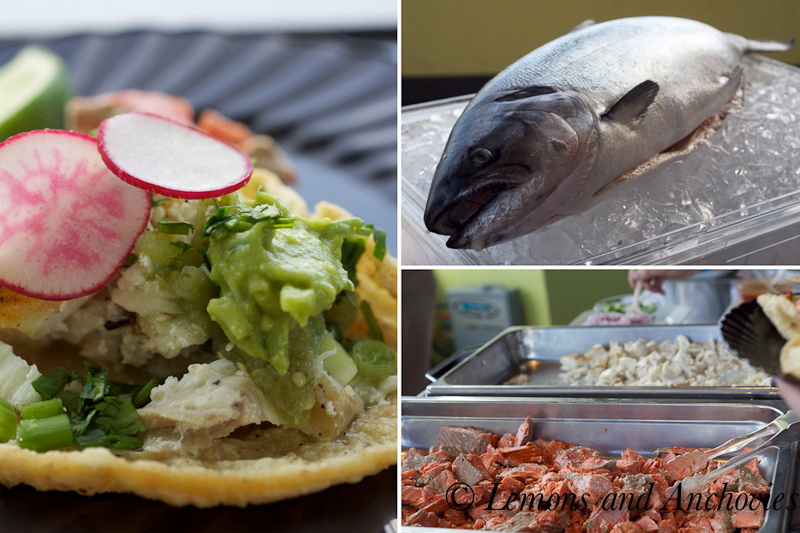 ASMI also teamed up with Chef Mary Sue Milliken of Border Grill to demo one of her restaurant’s specialties: Fish tacos featuring Alaskan Halibut and Alaskan Salmon. The only downside? Smelling the wonderful aroma of grilled salmon and halibut and being within reach of freshly-made corn relish but having to wait to taste it all. 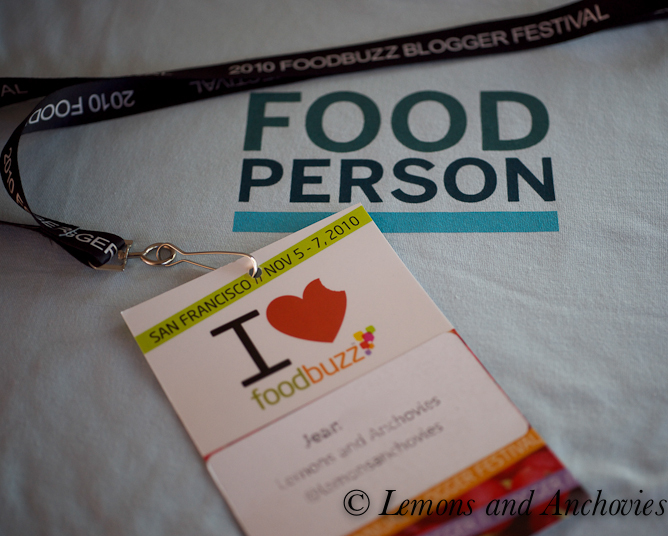 By midday, this blogger was hungry so I headed to Metreon with my foodie friends for the Taste Pavilion. I finally got to taste Mary Sue Milliken’s tacos. My favorite? Alaskan Halibut tacos topped with queso fresco, cilantro, salsa verde, guacamole and sliced radish. But there was so much more. Just like on the previous evening, my stomach couldn’t take in all that my eyes devoured. 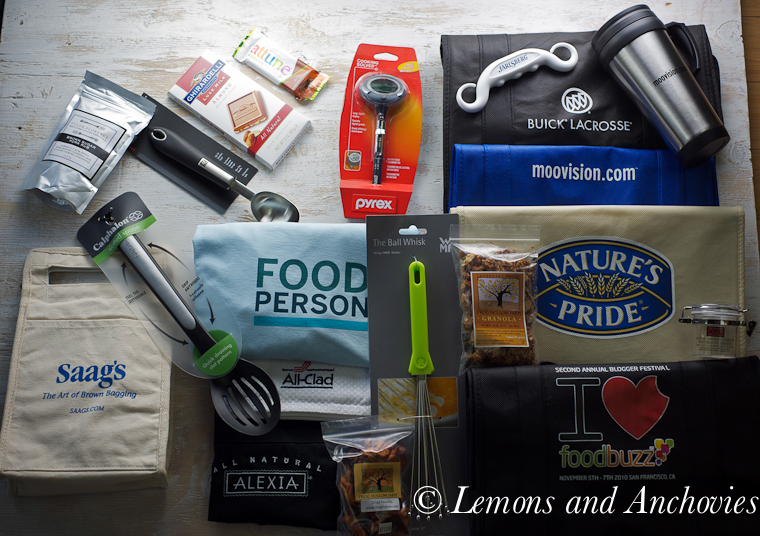 The festival sponsors were generous, offering their best while we bloggers consumed to our heart’s content. But of course, the best was yet to come. Dressed in our cocktail best, we gathered at San Francisco’s famous Ferry Building to dine on Seared Scallops with Bonny Doon Vineyard Verjus Beurre Blanc, Rosemary and Garlic Infused Rack of Lamb and Tarta de Almendras with Oranges, just to name a few. Each course was better than the next so you had to be sure to make room for each plate that was placed in front of you. Finally, it was time to go (was not able to attend the Farewell Brunch Sunday morning), but I walked away with more than just the great gifts above. I bade goodbye to new friends confident that we will once again cross paths at future events. Congratulations, Foodbuzz, for a job well done! 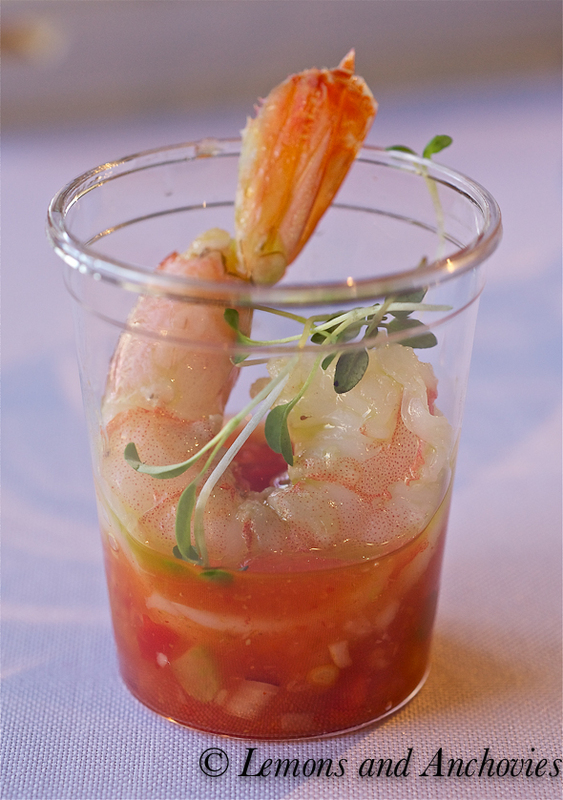 I’ll leave you with one of the recipes demoed by Chef Mary Sue Milliken. Give it a try the next time you make fish tacos. Heat 1/2 cup of the olive oil over medium heat and sauté the corn with salt and pepper for about five minutes. Set aside to cool in a large mixing bowl. Once cooled, add the remaining ingredients and mix well. Let sit for about a half hour to blend the flavors. Serve with your favorite fish tacos. I’m so glad you posted the recipe for that corn salsa – it was wonderful and I was hoping to make some this week! I’m so glad we were able to see one another again at the festival – such a wonderful experience, eh? I would have never thought when I started my blog that I would meet such lovely people as you and experience festivals like this one! So nice seeing you, though I wished we got the chance to chat more. Great recap of the weekend! it was so nice getting to meet you in person! I wish we had found more time to talk, I have truly enjoyed reading your blog, and now that I can really put a name to a face it makes it even more special! Looks like you guys had a great time ! Thanks for sharing the corn relish , I love dishes like that. After reading of the wonderful time had by all at the festival, I am definitely making it a goal to attend next year! You gave me such a wonderful insight to the weekend, thank you. Wish I could have gone, however your description pulled me in so I felt sort of there. Next year I will go! Jean – Reading your post, I so wish I was there!!! Sounds like everyone had such a great time. The Corn Relish sounds delish!! 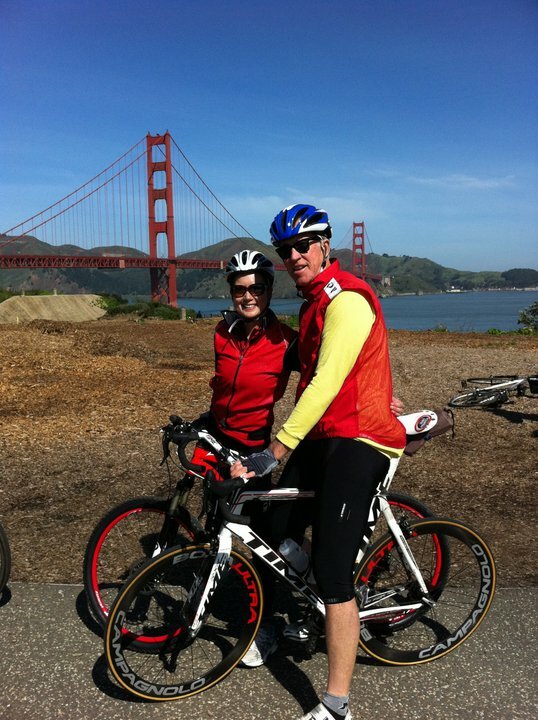 I had a great time at my company event in Sonoma – they did a fantastic job. Look forward to getting together soon to hear all about it. Lisa, it would have been fun to have you there, too. Next year, definitely. It was great to meet you. Oh how I wish I was still there eating! And thanks for posting the corn relish recipe, I can’t wait to make this! I want to try the fish tacos with the corn relish, it looks so good. As if I wasn’t regretting not going this year enough! Thanks for the awesome recap, I so wish I was there to meet all of you and to enjoy and that amazing food! It really was a fantastic weekend! Great post! Sounds like such a wonderful weekend!! I’m envious of you all and sure hope to be able to attend one day. Mary Sue Miliken is one of my favorites! I have their cookbook and have eaten at their Mandalay Bay Restaurant a number of times. How exciting to see her!! Thanks for posting a wrap up Jean! Thanks for the great recap! I hope to make it next year! Thank you for taking me with you! I wanted to attend so badly this year, but with everything that has happened with Baby Ryan…it just wasn’t meant to be. It sounds like it was an amazing time with great food and wonderful people! Thank you again for sharing. Have a beautiful Wednesday full of laughter and love! thank you for the wonderful account of an event I was so sad to miss! and thank you for posting the corn relish recipe! Jean it was a pleasure meeting you at the festival! Looking forward to seeing you again soon. Jean thanks so much for sharing the foodbuzz festival with us — I am sad I didn’t get to go 🙁 Hopefully I’ll make it to the one next year, it’d be so nice to finally meet you in person. Those halibut tacos btw sound amazing!